My trip to the BFI Mediatheque yesterday afternoon gave me an opportunity to see another one of the ‘Six Plays by Alan Bennett’ which were first broadcast in 1979. Sadly none of them have been released on DVD (although there is a listing on the BUFVC website for a VHS compliation – can anyone confirm if this was ever released?). 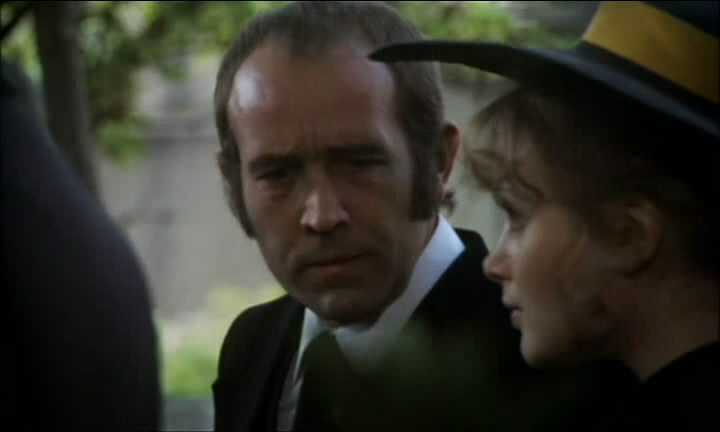 I had already seen four of the other plays (‘Me, I’m Afraid of Virginia Woolf’, ‘Afternoon Off’, ‘Doris and Doreen’, and ‘The Old Crowd’) but many critics, including the BFI’s own Screenonline, have described ‘One Fine Day’ as the most powerful of the series, so I put it top of my viewing list. Bennett is rightly known for his powers of observation in terms of conversation patterns and the minutiae of life, and this play is no exception, opening at a board meeting at the estate agents headed by Welby (Robert Stephens in a relatively rare television role), which deals with the sale of both residential and commercial property. The biggest white elephant on the commercial side is Sudley House, the sale of which is being handled by Phillips (Dave Allen in a non-comedic role), who is clearly remote from the world around him and heading for some kind of mid-life crisis. The play does have a wide range of character parts for the likes of Benjamin Whitrow, Bill Paterson, Liz Crowther, Barbara Leigh-Hunt (as Allen’s wife) and – in a tiny but revealing part – Antony Sher; but it is mainly a solo piece for Allen and a soundtrack rich in operatic arias, whether heard in his head or through the headphones he uses to block out the chatter of his wife, son, and son’s teenage girlfriend, who seems to be in permanent residence in their house. The peace and power of Sudley House does strange things to this 40-something businessman who longs to escape the inanity of lift-bound conversations about the best time to play squash, or the ingratiating ambition of a young residential agent (Dominic Guard) who feels he had the nous to sell on the unloved building. 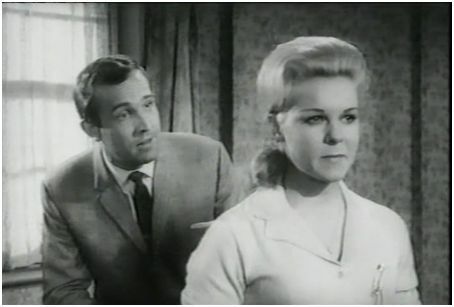 So Phillips takes up residence in the building’s unloved top floor, with a sunbed, radio/cassette player and a Bible – a place where his colleagues and family can’t get to him, but where he can observe a couple in residence on the roof of the local Odeon (first all loving and affectionate, but eventually bickering and violent), sleep in his deckchair on the roof of the building, and have a quiet cup of tea and a cigarette while enjoying the view over London. It is to the credit of the director, Stephen Frears, and Dave Allen’s acting ability as the main (and quite often mute) character, that we retain our interest in this odd person who flouts convention in order to do what he pleases, against the norm of his workplace and home-life. A nice bit of drama comes when the security guard locks the route to the roof, leaving our Mr Phillips to find his way down by another route; while snippets of dialogue and situation which impressed me included the girls in the office talking about beards becoming ‘too popular’ to be interesting, the discussion about hedgehogs and fleas the family have at the dinner table following Phillips’ encounter with a hedgehog on the road, and a delightfully oily performance from Stephens (‘I’m glad they’re Japs. So reliable.’). But in the main, this operatic and sweet little gem is quietly brilliant and very enjoyable, only occasionally breaking into situations one could call amusing, until the final few moments where we feel as exhilarated as Phillips that things have worked out in his favour, and to the expense of characters we might find less sympathetic. It is the best of the Six Play series that I have seen so far, and I lament the fact that it hasn’t had a television showing since the 1980s and is probably not known at all to a lot of people. Do take the time to watch it if you can. Update: this is now available on DVD from Network along with the other five plays in the series as of February 2017. Rounding out the cast, David McCallum as Edgar, June Thorburn as Isabella (her decline from flighty and flirty to desperate is sad to see), Jean Anderson as Ellen, Patrick Troughton as Hindley, and Ronald Howard as Mr Lockwood – his entrance to the house in a driving snowstorm is well-realised, even if we do realise it is a studio set. This Rudolph Cartier production was showing as part of the BFI Gothic season. His production of Anna Karenina from the previous year, also featuring Bloom, is available on DVD, but this Wuthering Heights is sadly locked in the archives. You can read more about this production at Screenonline. Recently restored and released to DVD, this television version of the three-times-filmed story of the cantor’s son who rebels and becomes a popular singing star was made for NBC’s ‘Lincoln-Mercury Startime’ series in 1959, and survives both as original black and white kinescope, and restored colour version. Both are presented on this DVD. Jerry Lewis remains an acquired taste when it comes to musical comedy, and continues to polarise audience opinion. I regard myself as a casual fan; that is, I can watch most of his films, but recognise that sometimes his work can be embarrassing and mawkish. However, this being a largely serious piece, it at least proves that Lewis can act, and in his supporting players (Eduard Franz and Molly Picon as father and mother, Alan Reed as his agent, and Anna Maria Alberghetti as his young lady friend) he is surrounded by professionals who keep the story moving. In 52 minutes the story is necessarily truncated to a few key scenes, but the message remains the same, and the closing scenes where ‘Joey Robin’ takes his father’s place in the synagogue are no less moving than in the versions featuring Al Jolson, Danny Thomas, or Neil Diamond. Released by the Inception Media Group on Region 1 DVD. 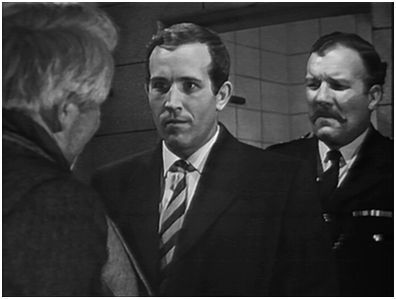 Red Letter Day was a series of one-off dramas which focused on a ‘big day’ in a character’s life. It is now available on DVD in the UK, released by Network, and here are my thoughts on the first two episodes. ‘Ready When You Are, Mr McGill’, written by Jack Rosenthal – who also devised this series – is perhaps the best known of the plays as it has been shown the most and has enjoyed a previous release as part of the DVD boxset ‘Jack Rosenthal at ITV’. It centres on a small television production shoot and the big day is for the extra, Joe McGill, who has been given a sixteen-word speaking part much to the chagrin of the other, more experienced extras on the coach. It is a wickedly funny piece with the egotistical director (Jack Shepherd), the sound engineer with over-sensitive ears (Fred Feast, a familar face from 1970s Coronation Street), the harrassed assistant director (Mark Wing-Davey, Hitchhikers Guide’s Zaphod), and other familiar faces including Jill Summers as ‘gossiping housewife’. A running gag throughout the play – aside from Joe’s attempt to get his line right – is a building being painted throughout the aborted attempts to film the one scene. ‘The Five Pound Orange’, written by Donald Churchill, is a drama about a man who has had something of a mid-life crisis, having ten months previously left his wife for a younger model with terrible taste in interior decorating. The title refers to a set of Queen Victoria stamps which he discovers are worth rather more than he imagined, and which currently reside in a tea chest at his old home. This slight tale involves his attempts to get the stamps back and in doing so, realising that the grass might not be greener on the other side after all. Peter Barkworth plays the errant husband, Natasha Parry his wife, and Sarah Badel the young mistress. I rather enjoyed this thanks to the performance of Barkworth in particular (who might be a familiar face from ‘Melissa’) and it is generally nicely done, with the stamps just becoming a peripheral device in something far more of the heart than of the pocket.